What makes Contesse so unique & revolutionary? Contesse is the ultimate “do it yourself” flooring product. It’s just that easy to install. No messy adhesives or glue is necessary. Because of contesse’s flexibility the planks can be installed over uneven sub-floors or existing floors such as natural wood, concrete, vinyl, linoleum, and even ceramic. Saving you time and money! Contesse looks and feels like wood, yet it is waterproof, so it can be installed in moisture prone areas that traditionally have been “off limits” for traditional wood flooring and laminate products, like basements and bathrooms. Each contesse plank secures to each other not your sub-floor, using the revolutionary GripStrip. It’s free floating. To cut a plank, simply score and snap. No underlayment is necessary and contesse is quiet and warm under foot. Follow the instructions for installation in the next section and you will be enjoying your beautiful new floor in just a few hours. Measure the length & width of your room. If the room has alcoves or offsets, measure these separately. This will give you the square footage of the room. Purchase a minimum of 10% extra to cover mistakes, trimming and for future needs and or replacement. HELPFUL HINT #1: Most installations require about 10% overage. However this can vary depending upon the room size and layout. 2. 1. 3. Condition contesse prior to installation We recommend you store contesse at room temperature of at least 18ºC for 24-48 hours before installation. You do not need to remove the planks from the case. HELPFUL HINT #2: When installing contesse be sure to keep dust, dirt or foreign particles away from the GripStrip. The cleaner the GripStrip remains, the better the bond between planks. The contesse planks are best kept in the box until you are ready to install them. A protective sheet of paper has been placed between each plank insuring the GripStrip remains clean and ready to use. This is a huge benefit of contesse! Virtually no surface preparation is needed. contesse can be installed over most existing floors including wood, vinyl, linoleum, concrete and even ceramic tile. HELPFUL HINT #3: If laying contesse over existing ceramic tile, it may be necessary to skim coat the grout lines with a floor leveler. If you install contesse over an existing floor that has an embossing or grout line on it, we recommend you skim coat with a floor leveler if the embossing or grout line is greater than 1/8”—(3 mm). If you have old, ugly vinyl and don’t wont to pay for an expensive removal and remediating job. contesse is the perfect answer. Any loose or damaged tiles should be patched prior to installing contesse over the old floor. Never sand old vinyl floors from any floor manufacturer, if you think the floor may be over 20 years old. We recommend the following actions in the room you are installing contesse in: Beware of any sheetrock taping and sanding, POE, painting, wall prep, finishes, and other activities that produce lots of dust. Cover your contesse with a drop cloth… Contesse is waterproof so it can be installed directly over concrete floors in the basement. If your concrete floor has any bumps or burrs of concrete sticking up, simply knock them off with a hammer and chisel. If the concrete floor has any larger dips or holes, you may want to apply a floor leveller to fill those areas, depending on the size and shape of the imperfections. Anyone can do it! HELPFUL HINT #4: Before laying out the floor, check the wall you are starting from and make sure it is square to the opposite wall. Simply measure the room from opposite ends of the wall to the far wall. If the measurements are different you can make adjustments on the first row of contesse by scribing the plank on the over edge. 1. Lay a row of loose planks without securing them to each other first to determine if you need to adjust the length of the first plank to avoid a small piece of less than 30.5cm on the opposite wall from where you started. 2. Installation should start in a corner and proceed from the wall with the under-edge facing out away from the wall (Figure 1). Allow a gap of 1/8” or less (2-3mm) for subfloor movement, which should be covered by molding. Trim off the top over-edge facing the corner wall (Figure 2). 3. When securing two planks together, you should angle (45 degrees) the second plank into the corresponding edge. The over-edge always placed on top of the under-edge. Use one hand to hold the plank and the other hand to guide the edge into place for a tight fit by rolling the plank as you go. Be careful to keep the seams tight. You can push the plank slightly against the adjoining plank to create a tight seam, if necessary, after the connection has been made. 4. One of the great attributes of contesse: it’s so forgiving. If your seam appears not to be tight, you can immediately pull apart the planks and reapply it. Slowly lift the top plank away form the bottom plank and simply reapply them—repeating Step #3. Be careful not to pull the planks apart to fast as you could rip or damage the GripStrip. You have at least 10 to 15 minutes of “open time” in which you can re-work the seams before any damage occurs to the adhesive on the GripStrip. The less pressure (or walking on) applied to contesse, the longer this “open time”. 5. When installing the plank, it is strongly recommended to stagger the rows so that the short edge (15.25cm) seams are not in a straight uniform line. We recommend the staggered random method (Figure 3). However you may want to try other “patterns” of planks to suit your taste. contesse can be installed with endless possibilities—your only limitation is your own imagination! Have Fun!! 6. Start the second row with the plank cut at about 2/3 length (61cm). Simply measure and mark the plank, then using a straight edge and utility knife, simply score the plank and snap. 7. The over-edge butts up to the first row. Again, get one corner of the plank started tightly against the other and on a 45 degree angle roll the plank tightly into place. The remaining 1/3 piece can be used on the far wall, if the layout of the room permits. HELPFUL HINT #5: When cutting contesse for length, be sure to always cut the short side of the plank with the over edge. The remaining piece can then be used on the opposite side of the room, at the end of that row (Figure 4). 10. Fitting around irregular objects, no problem. Simply make a pattern out of heavy paper to fit around pipes or irregular objects. Place the pattern upon the plank and trace. Cut along trace lines using a utility knife or heavy duty scissors, and lay plank. 11. 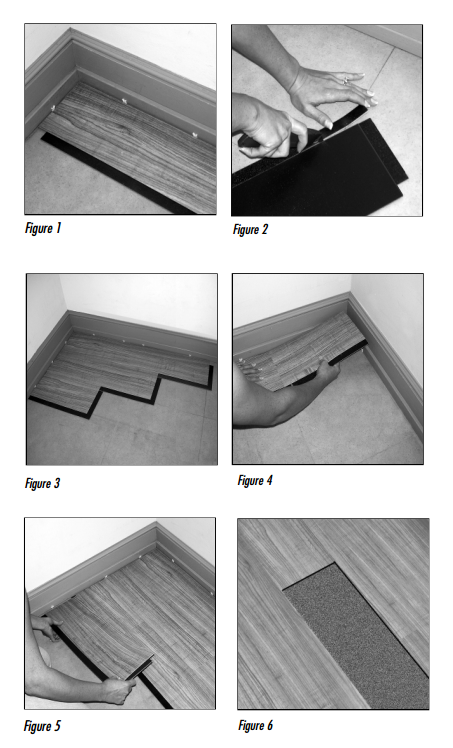 After installation is completed, we recommend rolling the seams with a floor roller to insure bonding of both adhesive edges. You can rent a floor roller from your local tool rental centre.